Summary : This tea from the Dragonwater Tea Company (now out of business) surprised me, truthfully. I found this tea to be quite flavorful, even without anything added. And the tea lacked any sort of nasty after-taste or bitterness, too. Review : So I have no life. Yeah, it's true. Here it is...2 am. And what am I doing? Drinking tea, drinking some wine too, writing up a tea review and chatting online with a friend who is, happily, a night-owl too. But you know what...at least I'm honest about it all. And this honesty comes in handy when writing up unbiased reviews about tea too. And so it is that I found myself this fine evening, or I should say morning, drinking some Formosa Oolong tea that is put out by the Dragonwater Tea Company (now out of business). Here is the description of this tea as provided by the Dragonwater Tea Company (now out of business) : "The best Oolongs come from Taiwan (Formosa) where the character of short-fired oolongs has been described as peachlike with a refreshing fruity herbaceous character whereas long-fired oolongs take on bakey notes with rich amber liquids. This tea falls into the latter category." And you know what, Dragonwater hit the nail on the head when describing this tea...one thing I like about them, they are to the point and honest about describing their teas! I'll confess...I was very pleasantly surprised by the flavor of this tea. Unlike some other oolong teas I've tried, this tea did indeed have a nice, partially sweet, even a bit of a fruity flavor to it. It wasn't nearly as sweet as say a mint tea or as fruity as a herbal tea...but it also wasn't as "unsweet" as a standard black tea, either. Moreover, this tea was just plain "smooth." There was no bitterness, no lingering unpleasant after-taste, and, above all, no "lip puckering" moments as you drank it. In short, it is just a very pleasant tea to drink. Overall, if you enjoy oolong teas, you'll almost certainly like this one. And for those people out there who have never tried an oolong tea before, well, this one makes a great tea to start out with, as it is a "pure oolong tea" (nothing added to it) yet lacks some of the "nasty surprises" found in some other pure oolong teas. Recommendation : Yes. If you have never tried a oolong tea before, this tea makes an excellent place to start. It has an excellent flavor, yet the tea also is very, very smooth...with no bitterness. And if you like other oolong teas, I fail to see how you can't like this one! Brewing Instructions : Use 1 tablespoon of leaves. Pour 6-7 ounces of water heated to boiling. Let brew for 2 minutes. Numi Water Sprite Ginger Oolong Tea : An organic oolong tea combined with a powerful infusion of organic ginger. This tea has a bit of spice to it, too. Adagio Teas Oolong #8 Tea : A high quality "straight" oolong tea. Also makes a fine "intro" level oolong tea, too. Dragonwater Passion Fruit Oolong Tea : A superb, fruity and moderately sweet oolong tea that is ideal for people who have never tried a good oolong tea before. 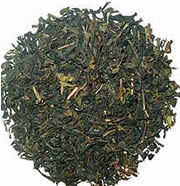 Adagio Teas Ti Kuan Yin Oolong Tea : An unusual oolong tea that looks like and tastes like a green tea.